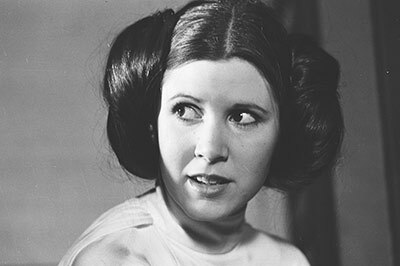 Fisher was 19 years old when she became a cultural icon as Princess Leia in A New Hope. Her film career started when she was even younger, playing opposite Warren Beatty in Shampoo in 1975. She is the daughter of actress Debbie Reynolds and singer Eddie Fisher. In addition to A New Hope, The Empire Strikes Back, and Return of the Jedi, Fisher has performed in numerous movies and television series, including memorable appearances in The Blues Brothers, The Man with One Red Shoe, Hannah and Her Sisters, The Burbs, When Harry Met Sally, Austin Powers, Heartbreakers, Fanboys, Sorority Row, Angela as Mon Mothma in Family Guy, and in her own television specials, including the autobiographical Wishful Drinking.